This is possibly the most contentious section in the draft Guidance. This is the fifth of a series of blog posts commenting on tracked changes to the draft Elective Home Education Guidance for Wales. The public consultation closes on July 3rd. Better just to quote s436A (Children Missing Education), rather than paraphrase it. The paragraph beginning ‘Home educated parents should therefore be encouraged to take up the offer of advice and support…’ is extremely unhelpful. Home educating parents don’t have to meet the council ‘because of Children Missing Education.’ I have written about this here. In some cases it can be useful for families to have someone in the council they can contact before taking children out and soon after children have come out of school (phone, email, face to face), but it is counter-productive to frame this in terms of checking on parents as though home education needs to be approved, and does nothing to ‘rebuild trust’ [3.2]. A better approach is used in Lancashire. In Lancashire’s experience, some families actually want to talk to someone sooner rather than later. For example, a parent might contact the LA to say they thought the LA would provide a tutor. When this happens, parents are asked if they want to continue home educating or for their child to return to school. If the LA finds that the school has put any pressure on the family to take their child out of school or misrepresented the situation to parents, then the LA will intervene and challenge schools. 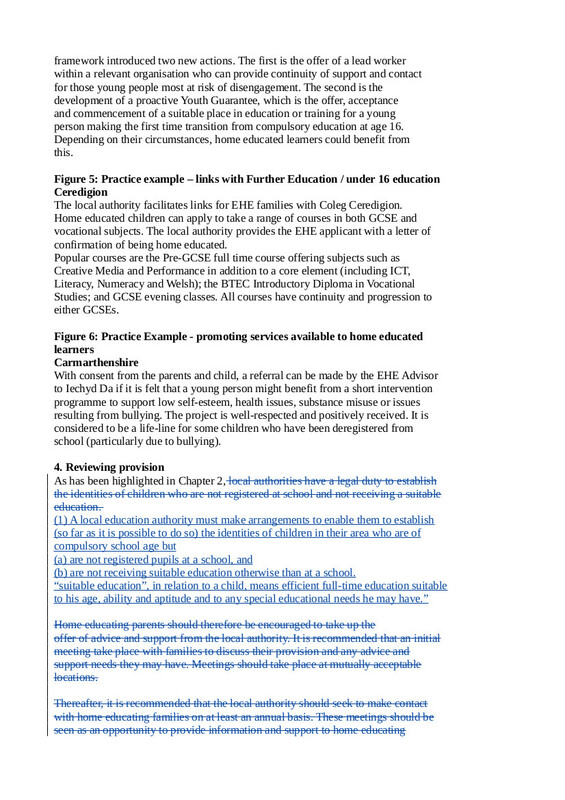 Lancashire is not proactively looking for evidence that education is suitable, so it doesn’t make home visits the default, or ask for exhaustive information about the home education provision. Because Lancashire is not looking to assess the provision, families are less likely to feel they have to keep the authority at bay. If a concern is raised about a child’s education, the LA will inform parents and at this stage a home visit will be offered. Some parents agree to meet, other parents will address the concerns by providing information without a face to face meeting. As indicated in 3.3 Practical considerations, the contact in the draft Guidance is seen as all one way; with families passively receiving notification of their annual check-up. This ties in with the recommendations in 3.3 for a ‘regional coordinator for EHE or a single point of contact’ and fits with the direction of travel elsewhere in Wales in amalgamating council functions and cutting the number of councils. In England unfortunately we have the example of the Triborough with Westminster, Hammersmith, and Kensington, where the more interventionist stance has prevailed.